Wow, we had almost eight hundred students vote on the Elite 8 series bracket! I am so proud of the participation from our McKinney High Students. Let's keep up the momentum. Students and teachers have until 2:30 P.M. on April 5 to vote for their favorites in the Final 4 round. 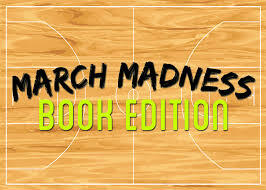 Voting for our March Book Madness starts tomorrow! Brackets are available in the learning commons and on our website: gg.gg/MISDBooks17. There is a voting tab on that website for students to vote for the winner in each Sweet 16 Book Battle. If students have not read the books, there is also a Book Trailer tab where they can view a little bit about each book before voting. We have some really amazing prizes for the winning brackets, and we will choose an overall, Grand Champion winner (from the perfect brackets) for the district. On Tuesday, the high school MRS team, as well as the McKinney Public librarians came together to do a book concert at McKinney North High School for all of the English classes. We shared almost 50 titles with the students throughout the day. It was a huge success! Check out the Booktalk Concert slideshow below. This March, students across all three McKinney high schools will get the chance to vote for their favorite book in the first annual March Book Madness contest. Students can nominate their favorite book in the preliminary round. The top 16 books will move on to be placed in the March Madness bracket. Nominations are open now and will close Wednesday, March 1. Please go HERE to nominate your favorite book. This past year, Ms. Allen and a group of students from MHS formed a group called the Literary Club. They began meeting every week after school to share their writing and quickly decided to create and publish an anthology of student writing and art. The word spread across campus and students began to submit their works to be published. The first issue titled The Lost Art was a huge sucess and will only continue to grow! Congratulations to Ms. Allen and the students that are part of the Literary Club! Did you know you can get free audiobooks all summer long? SYNC YA begins May 15 and the list of FREE Young Adult audio books is up on the site. http://www.audiobooksync.com. Sign up now using your email or smart phone. If you have the Overdrive app, that is a great way to download the FREE books each week and listen to them. You can even import the audiobooks into iTunes after you download them. Attention seniors...MEF will award their 5th annual library scholarship sponsored by the staff of all the MISD Library Media Centers. Turn in a hard copy of your essay to Mrs. Spain or Mrs. Gonzalez in the MHS media center no later than February 14, 2014.